for any required keywords in this site. 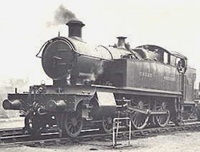 The Great Western Railway, known to GWR enthusiasts as God's Wonderful Railway, was Britain's oldest railway company until nationalisation in 1948. Created in 1835, the GWR began with a 7 feet 0¼ inch broad gauge line from Bristol to London and grew into a network covering the South West, the Midlands and Wales. On a grand scale, the brilliant engineer Isambard Kingdom Brunel designed stations, bridges, viaducts and tunnels, while later the company's locomotive engineers of Dean, Churchward and Collett created the prettiest and most powerful engines ever designed. When steam was killed off in the 1960's, few realised that the enthusiasm for this form of motive power would never die and thanks go to those few people who nurtured the steam revival into the following that it has today. These pages are a tribute to those few who now give pleasure to so many.